Parish campaign goals were set by taking the average of the 2010, 2011 and 2012, offertories and multiplying by 110 percent. What is the 75/25 Split? The Diocese acknowledges that along with larger diocesan-wide needs, each parish has its own projects, ministry outreach and service programs that need funding. Therefore, 25 percent of every dollar raised will be split with each parish up to their goal. Once the goal is reached, the parish will receive 67 percent of each dollar raised above and beyond their goal. 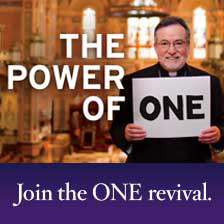 The Diocese will be responsible for the redemption phase of the campaign (collecting the pledges). The finance office will deposit all funds into The Catholic Foundation of the Diocese of Sacramento, and will track pledges and gifts, and handle the payment reminders over the designated four-year pledge period. Is This Goal an Assessment? No, this campaign goal is not an assessment, but instead a good faith effort goal. As long as a parish conducts a good faith effort, they will not be assessed for the remainder if they don’t reach goal. When will Parishes Begin to Receive Their 25% Share? The parish will receive their first distribution of 25 percent of cash collected up to their overall campaign goal and 67 percent of each dollar raised above goal each quarter throughout the redemption period. If a parish completes a good faith effort, they will receive their 25 percent of each dollar raised whether they reach goal or not. In the short term, offertory giving should remain level, with a possible small fluctuation up or down. We make sure we communicate that parishioners are asked to consider a greater sacrifice and commitment to their diocesan church above and beyond their regular offertory giving, and should not lower their gifts to their parish to make a gift to this effort. How is This Campaign Different from the ACA and How Do We Communicate That? The Annual Catholic Appeal (ACA) generates funds for the daily operations and sustainability of existing diocesan ministries and programs that touch the lives of thousands of people throughout Northern California. Whereas, the campaign aims to generate new funds to meet the projected increases in costs for some of the programs, and offer brand new funding for other services currently unavailable through normal operating budgets. Our plan calls for building awareness of the differences in these two vital efforts with strong and consistent communication to parishioners across the Diocese through informational receptions, personal visits, pulpit announcements, personal testimonies, mailings, brochures and a video. The expenses for the campaign are based on bids and a flat fee, which do not go up or down depending on the total amount raised. Costs include counsel for fundraising, travel to every parish throughout the course of the campaign and the production of operative materials. The Diocese projects the campaign to cost approximately $4 million, or 8 percent of the established campaign goal. This is well below the cost of many fundraising efforts, which often exceed 10 percent of their overall goal. Why are Parishioners Asked to Pledge Different Amounts? We understand that each family’s situation is different. We are asking every family in the Diocese to make an equal sacrifice to the campaign. The amount of sacrifice will be different for each family. Some families will be able to give more than others, but we ask that the sacrifice be the same. Parishioners are asked to prayerfully consider a specific gift plan in accordance with their own means and circumstances. Pledges are payable in monthly, quarterly, semi-annual or annual installments over a four-year period. The principles of stewardship promote equal sacrifices rather than equal gifts. Pledges provide parishioners with the opportunity to make a more significant gift to the mission of the Church. A contribution is easier to pay off over a period of time rather than out of pocket. It is important to note that pledges are not legally binding but rather a statement of what you intend to do. Can a Donor Designate Their Gift to a Specific Case Item? Yes. Donors can specify special interest on their pledge card with the exception of the parish share portion. Please keep in mind, if a donor restricts or designates their gift to a particular case item, it will be credited toward the parish campaign goal, but it does not qualify for the 75/25 parish share split. Legally, designated gifts must go in their entirety to the designated case item. What is the Catholic Foundation of the Diocese of Sacramento, Inc? The Catholic Foundation of the Diocese of Sacramento, Inc. is a separate 501(c)(3) non-profit corporation organized and operated exclusively for charitable, religious and educational purposes. It is charged with receiving contributions intended to benefit supported Church programs, ministries and outreach, and managing and distributing such contributions for the benefit of supported activities.